VAIL PASS ” The cab of a tractor trailer ended up dangling off the edge of a bridge on Vail Pass Tuesday morning after the driver lost control, the Colorado State Patrol says. The accident happened at 9:15 a.m. in the eastbound lane of Interstate 70 near mile marker 184 on Vail Pass, said State Patrol Cpl. Larry Graves. 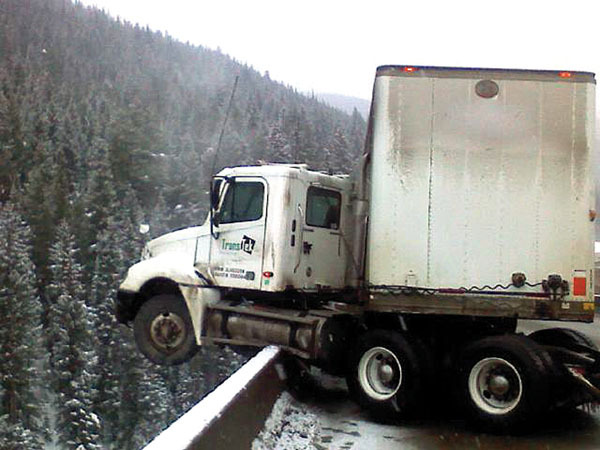 “He was going up Vail Pass and lost control on the icy bridge,” Graves said. The trailer was driven by 23-year-old Fransisco Chavez-Ramirez, of Longmont. Graves said Chavez-Ramirez lost control of the vehicle, hit the barrier in the middle of the highway and then slid into the concrete wall on the right side of the road. Part of the tractor was dangling over the edge of the bridge ” which drops about 100 feet to the ground ” after the accident, Graves said. “Most of the tractor was hanging off the right side of the bridge,” Graves said. About 50 gallons of diesel fuel was spilled on the road during the accident. And although the fuel got near a creek, it never made it in the water, Graves said. The Vail Fire Department responded to the accident and helped clean up the fuel. Officials had to close both eastbound lanes of Vail Pass near the accident for about 30 minutes while a tow truck pulled the tractor back over the bridge. One eastbound lane near the accident on the highway remained closed for about three hours. The tractor’s driver didn’t have chains on his vehicle, but the chain law wasn’t in effect during the time of the accident, Graves said. No other vehicles were involved and no one was injured during the accident, but the driver was cited for careless driving, Graves said. Officials weren’t concerned the vehicle would tip off the edge of the bridge.